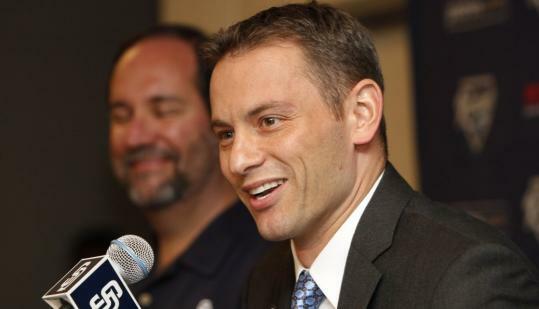 SAN DIEGO - Jed Hoyer, the new general manager of the San Diego Padres, said all the right things during his introductory news conference yesterday, but he fell short of saying what Red Sox fans wanted to hear - that he would trade superstar Adrian Gonzalez to Boston. The 35-year-old Hoyer’s biggest asset as he takes over a team with a $40 million payroll, about $100 million less than he had in Boston as an assistant to Sox GM Theo Epstein since the end of the 2003 season, is Gonzalez. He could bring a small fortune in prospects, and Hoyer probably has a willing trade partner in his former boss. One wonders how much the two already have talked about a deal for the lefthanded-hitting first baseman. Hoyer said he was quite familiar with the Padres’ personnel, having studied the team inside and out for his discussions with new owner Jeff Moorad, which Hoyer said began in mid-September. Asked if he would participate in trade talks at the general managers meetings in Chicago and the winter meetings in Indianapolis, he said that after he gets input from the staff he inherited, which includes manager Bud Black, he would have a better idea what he had to trade. Hoyer always has been a fan of Gonzalez and has noted that he would be a great fit for Fenway Park because he hits the ball the other way with power. Wearing the other hat yesterday, Hoyer emphasized that he wants to build a team that’s best-suited for spacious Petco Park, which means building pitching and defense. Does Gonzalez fit what Hoyer would be trying to do? Hoyer praised his predecessor, Kevin Towers, the GM the previous 14 years, for the shape he left the organization in, and he mentioned that Towers left him a nice note in his desk. Hoyer also was generous with praise for the people he’s leaving behind - Epstein, Larry Lucchino, John Henry, and Tom Werner - and those he’s about to work for, namely Moorad, who for the second time plucked a GM from the Epstein/Boston tree. When he was in Arizona he secured the services of Josh Byrnes. Hoyer said he hopes to build in San Diego what Epstein promised he was going to build when he first took the Sox job - a “scouting and player development machine.’’ He’ll do it with that inherited staff, but there are strong hints that Hoyer will get to surround himself with some people he knows. Yet he’ll have to do it the hard way, via player development and likely with very infrequent free agent signings. Yet the money came in handy when filling a need the farm system couldn’t. “[With] a middle-market team, it’s harder to retain your own players,’’ he said. “I think in a big market when you have a talented player and it’s getting closer to free agency it’s easier to make that big deal to keep him. “The difference having a smaller payroll is you can’t recover from that bad financial mistake. In a place like Boston it’s a little bit easier to paper over it. If you make a mistake on a player it’s easier to figure out a solution. You have to be more careful with those kinds of decisions. Hoyer, who received a long-term deal (although perhaps not the eight-year contract Moorad gave Byrnes in Arizona), said he had looked at other situations for his first GM job, and said San Diego easily was the best job he has come across. Hoyer, who played baseball at Wesleyan, was presented with a No. 11 Padres jersey, his collegiate number. He spoke about his time as an intern under Epstein and the stories of working until 4 a.m. in the Fenway offices. He praised Epstein for allowing him to get involved in all aspects of the organization and said he would not be the last to earn a GM job from the Epstein tree. With 40 years in the books and no championship in San Diego, Hoyer was asked when could he guarantee one? “Hopefully it won’t take 86 years,’’ he said.